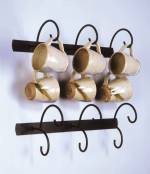 A classic wrought iron look, this sturdy metal mug rack is perfect for displaying 6 of your favorite tea cups, or coffee and beer mugs. Adjustable hooks let you space the items as necessary and can be removed if you only have space for fewer than 6. Rack measures 31" wide and is hand made here in the USA. You will be happy with the quality and craftsmanship of this piece!